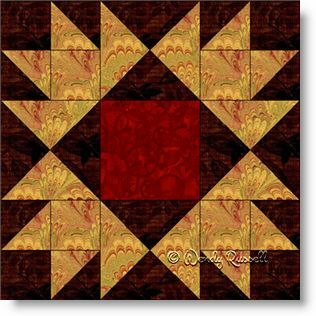 The Bear Tracks quilt block is an old favourite. It looks wonderful using either a dark or a light fabric for the background. Here I have chosen to use a dark fabric to offset the other features of the quilt block. This is a great nine patch block for teachers to use because it contains both the half square triangle and quarter square triangle patches. The two sample quilts illustrated show the blocks set side-by-side and on point. Both quilts use sashing to separate the quilt blocks. However in the on point setting, the sashing is the same fabric as the background, resulting in the impression that the blocks are "floating" in the quilt.